ü have us visit your school or library? ü learn how Darryl took those photos? ü hear about how Gillian writes, or where she gets her ideas from? ü learn how a book is written and published? Childrens authors Darryl and Gillian regularly visit New Zealand schools and participate in the Annual Storylines Festival. We provide interactive and lively presentations that are enhanced with digital data shows. Our visits are always lively, entertaining and inspiring. New Zealand Book council links for:- "Gillian" and "Darryl"
Book Talks, connecting Authors with Readers: links to Book talk web site for:- "Gillian" and "Darryl"
To arrange a school visit or author talk, please contact us. 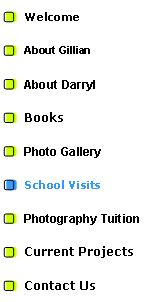 Darryl will show you a selection of his award-winning photographs. He’ll share some of his closest and scariest moments underwater with you, giving away some of his trade secrets along the way. Hear how he wrestled his camera away for an octopus; was taken for a ride by a 3 metre-long baby humpback whale or his shark encounters. Make your own underwater scene on our felt board with our cut out marine life. Gillian will lead small groups of students, to find their own creative writing skills. Using her very popular What am I ? in the Bush and What am I? Marine books, she will guide children to brain storm their own ideas, to use interesting language and target their writing within certain styles. For small groups of students, Darryl will share some of his advanced digital manipulation skills that he has used in books such as Life Size guide to NZ Fish and Real Size Guide to Rocky Shore. Gillian will read to you from a selection of her books and discuss where her ideas and inspiration come from. She will share with you some of the experiences that have contributed to her collection of books.